Invisalign treatment uses a series of clear acrylic aligners that the patient wears over his or her teeth. These products are designed to gently guide the teeth into alignment. They do so without the discomfort and inconvenience associated with traditional braces. The patient wears each set of aligners for about 10 days, switching to the next set as therapy continues. Your dentist will check your progress from time to time and may make adjustments as needed. How long the patient wears the product per day. Invisalign dentists recommend keeping the aligner in place at least 22 out of every 24 hours. It’s fine to take the product out from time to time in order to brush one’s teeth, eat meals, and tend to other personal tasks. The care the patient shows for the product. It’s important to keep each set of aligners away from heat sources, rinse it in water after meals, and store it in its included carrying case when not in use. Daily cleaning. The patient should use either a standard denture cleanser or the manufacturer-recommended cleaning crystals. The degree of alignment needed. This factor will vary widely from one patient to the next. 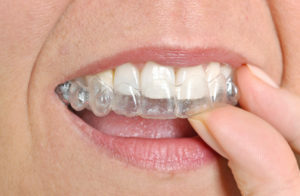 Invisalign works best in cases of mild to moderate dental misalignment. Is Invisalign for Younger People? Invisalign therapy was developed especially for adults who need the benefits of alignment therapy but are unable to wear traditional braces due to practical or personal concerns. However, the product can also benefit many older teenagers whose teeth have fully developed. Your dentist can advise you further. What Will Happen If I Avoid Alignment Therapy? Misaligned teeth are a serious health problem. Not only are they more likely to suffer from cavities, they can also put the patient at risk for problems like headaches, back and neck pain, and TMJ disorder. This is aside from the aesthetic problems often caused by poorly aligned teeth. What Happens Once Invisalign Therapy Is Finished? Once treatment is complete, most patients only need to wear a nightly retainer to maintain the benefits over the long term. He or she should also practice good oral care habits like daily brushing and flossing, eating a sensible diet, and seeing the dentist twice a year for cleanings and checkups. Invisalign makes it possible for almost anyone to enjoy not only better dental health but a more beautiful smile. Talk to your dentist in Westmont soon about this popular and effective treatment option. You’ll soon find yourself with plenty of reason to smile. The team at Jason Hong and Kathy Lam DDS is devoted to providing the very best treatment experience possible. Dr. Hong and Dr. Lam provide general, cosmetic, and restorative procedures to their valued patients. You can reach the office online or by calling (630) 789-1555.